Groups that are new to the Five Sketches™ design process may need help to boost their confidence. That’s because people mistakenly believe that sketching has to be artistic and beautiful. In fact, it’s the opposite. Sketching is merely to communicate ideas—lots of ideas, in our case. Sketching is not about the quality or fidelity of the image, because higher fidelity means it took more effort, and people get attached to that effort, even when the idea isn’t so great. Rationally, would you want to keep a mediocre idea simply because it took a long time to sketch? Or would you rather have a dozen rough ideas to choose from, so you could pick and choose the best parts and mash them together, into something better? 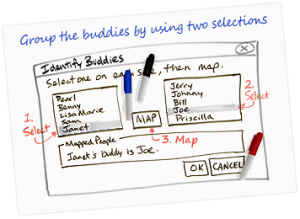 Five Sketches™ sketching is about quickly capturing and sharing many ideas so they can be understood and re-used by others. During the Five Sketches™ process, a sketch must be able to communicate to people sitting across the table from you after you post your sketch on the wall behind you. And it must communicate on a wall covered in competing sketches. Here’s how to ensure a sketch can communicate. Sketch on large paper that’s cheap—because many of your ideas will be discarded. Tabloid paper (11.5 × 17 inches) or A3 paper (30 × 42 cm) is best because it’s big—but can still go through a photocopier for scanning. Sketch only enough detail to communicate the idea. Sketching is about capturing ideas and thinking through ideas in low fidelity. Clutter makes it harder for others to read the sketch. Use fat-nib markers. This ensures a sketch is legible from ten feet away, and discourages excessive detail. Careful with colour. Reserve red markers only for labelling the user actions and system responses, if needed. As facilitator, you need to reassure the participants that they can sketch. Give each group member some large sheets of paper and some fat-nib markers, as described above. To start the exercise, ask the participants: “Use 10 seconds to draw me a house. Start now.” Count aloud from ten to zero, and then ask them to stop. Have people look at the other sketches. Usually, each sketch is recognisably a house, but don’t draw attention to unusual details. Instead, ask them to point out the common elements: a pointed roof? a door? a window? a chimney? Do sketches still communicate the idea of house effectively when some of the common elements are missing? Next, ask everyone to carry on, in quick succession: “In 8 seconds, draw a plane.” And then: “In 6 seconds, draw a baby.” And then: “In 4 seconds, draw a car,” and “In 2 seconds, draw a ship.” After these four sketches, ask them to point out the common elements of airplane, baby, car, and ship. Is there a limit to how fast people can sketch and still communicate an idea clearly, to others? 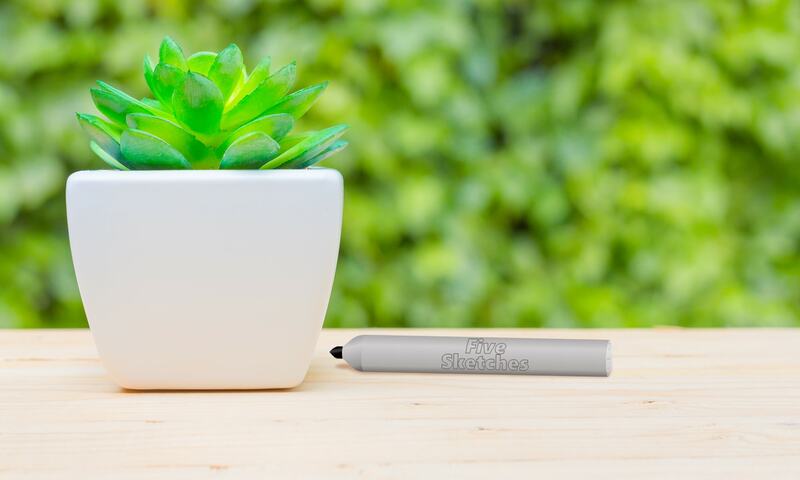 Sketch quickly, with only the most essential details. Which details could this sketch do without while still conveying the idea of “a boat”? Now ask people to take 15 seconds each to draw: a mobile phone, a browser window, a Print dialog box, a tablet in landscape mode, and airport check-in kiosk. If your team needs to work with a specific type of object, ask them to sketch that in 5 or 10 seconds. What is the minimum number of lines that still communicates that object effectively? Display a news website, such as bbc.com/news. Ask people to sketch the site’s home page—but generically, without today’s specific content. Give them 30 to 45 seconds. Then discuss with the group how they sketched the following elements: a heading, a paragraph of text, a photo, a link, a button, a tab. How much detail is sufficient? Would different colours help, such as blue ink for links, and black ink for everything else? Use a red marker to label potential user actions on the page. Lastly, add a title to the sketch. The majority of people who work in software development would prefer to produce “sketches” with the help of their computer. Here’s why this is a bad idea during the idea-generation phase of a design process. Why five sketches? Why not three? It’s not just about the total number. There are individual benefits to sketching that also benefit the organisation. Set the problem statement just right. Before you start sketching, ensure you’re solving the right problem. Competing ideas at the finish line? Here’s how to pick a winner, by helping the team to make a decision that satisfies all participants.